Full HD is a must-have on a 50in set destined for use with a Blu-ray deck. LG's mid-range 50PS7000 ticks all the boxes in this regard, while adding some unique multimedia features embracing online HD video. Its four HDMI inputs are a welcome sight, though one of them can't cope with SimpLink. This means you won't be able to control basic functions of a Blu-ray player via this input, suggesting that it might be put to better use with a games console instead. Compatible with MP3 music and JPEG photos, the TV's media player can also play a host of digital video files such as MPEG, MOV, AVI, DivX and, crucially, MKV files. The latter enables new DivX HD files to be played in 1080p quality, straight from a USB memory stick. Another nice extra is the 50PS7000's Bluetooth connectivity that enables you to send and receive pictures and MP3 files from a mobile phone. Meanwhile, the set's 600Hz Sub-field Driving technology outguns anything else on the market. It works by inserting 12 sub-frames into each frame of film, largely to reduce the appearance of image jag and onscreen blur during fast-moving shots. Multiply that by the 50 frames present in 50Hz footage and you come up with that magic 600Hz number. Also on show is LG's Dual XD Engine, which looks to improve colour correction, sharpness, contrast and shadow detailing in dark areas of the image. The 50PS7000 must be one of the easiest TVs to operate. A simple icon-based menu system takes you where you want to go very quickly, while the functional remote's 'quick menu' presents a dial design in the corner of the screen for making small changes (such as aspect ratio, audio and picture modes) without interrupting what you're watching. 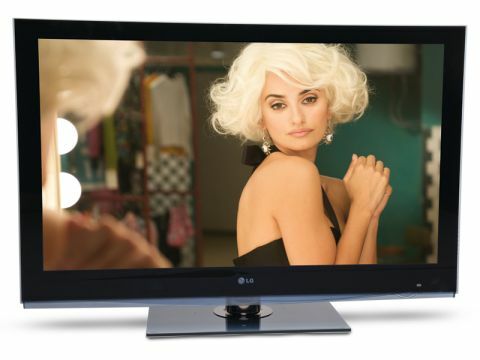 This is not LG's most advanced plasma, although the amount of picture tweaks on offer suggests otherwise. Its key feature for the non-techie is Picture Wizard, which presents a six-step collection of simple test patterns so that you can set the contrast, colour and sharpness levels without getting too involved in jargon. Serious users should dive into the 50PS7000's ISF-certified advanced menus and assign changes (to everything from gamma and colour gamut to edge enhancer and colour temperature) to the set's two Expert modes. Set-up for its built-in Freeview tuner is a cinch, with a simple and good-looking seven-day guide's responsiveness proving as lightning-fast as the tuning process and onscreen menus themselves. Despite the 50PS7000's full HD resolution, there's not quite as much detail on show as on a comparable LCD TV. That said, a run through of Kubrick's Full Metal Jacket is a wholly more cinematic experience; while slightly lacking in pin-sharp detail, pictures are a lot cleaner and more believable. During the dim, blue-lit scene at boot camp where Private Pile takes a beating, there's admirable detail in dark areas of the image, though it never reaches reference levels. A daytime scene of the GIs drinking in a Vietnamese roadside café reveals a richness to colours you won't find on most liquid crystal TVs, though there's a slight orange bias that leaves skin tones just off target. There's also a small judder as the camera pans across some billboards, although fast-moving objects don't suffer from noticeable blur. The 600Hz feature doesn't add much to what was already (on LG's previous plasmas) a relatively smooth picture, but it does cement plasma's continuing advantage over liquid crystal in this regard. A DivX HD trailer (in 720p resolution) for Star Trek from a USB stick proves less fluid than Blu-ray, but the opening scene of James T Kirk driving off a cliff indicates that DivX HD is definitely a format worth watching. Standard definition fares less well, as Match of the Day on BBC1 looks drained of colour with less defined edges. Picture noise makes an unwelcome appearance, too, though the Freeview image is still preferable here than on many LCD TVs of this size. The set deftly proves that the bigger the TV, the better its speakers. It performs particularly well with music, with plenty of treble detail and some acceptable bass effects. It all helps to make MP3 files sound that much better, too. Its lacklustre performance with SD aside, the 50PS7000 is an excellent value big-screen plasma that's best suited to anyone who wants a decent all-rounder, but who plans to watch a lot of HD material.